Home » bbc , doctor who , science fiction , television » "The Rings of Akhaten": Chris gets moved to tears by the profound beauty and wonder of this season's best DOCTOR WHO yet! "The Rings of Akhaten": Chris gets moved to tears by the profound beauty and wonder of this season's best DOCTOR WHO yet! "Come on then... Take mine. Take my memories. But I hope you've got a big appetite, because I've lived a long life and I've seen a few things. I walked away from the Last Great Time War. I marked the passing of the Time Lords. I saw the birth of the universe and I watched as time ran out, moment by moment, until nothing remained. No time. No space. Just me! I've walked in universes where the laws of physics were devised by the mind of a MAD... MAN. I've watched universes freeze and creations burn. I have seen things you wouldn’t believe. I have lost things you'll never understand! And I know things. Secrets that must never be told. Knowledge that must never be spoken. Knowledge that will make parasite gods BLAZE! SO COME OOOOON THEN! TAKE IT! TAKE IT ALL, BABY!! HAVE IT!! YOU HAVE IT ALL!!!" And if you weren't moved to tears also by Murray Gold's majestic orchestral score and Matt Smith's epic stand of daring in the final moments of "The Rings of Akhaten", then... well, you're a pathetically jaded person who needs a hug in the worst way. 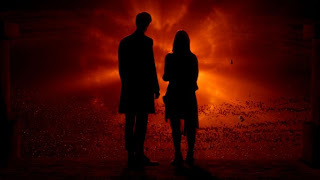 The reviews of "The Rings of Akhaten" seem to be all over the place, with most saying that they felt "underwhelmed" by this newest episode of Doctor Who. Me? I thought it ranks as the best of this season by far... and so help me, I had to choke back from full-blown crying during the final few scenes! ...but that first half is rife with more legendary Doctor Who mythos than any episode we've seen lately. C'mon: I couldn't have been the only one who noticed Matt Smith's Doctor take that defensive stance with the Venusian Aikido that the Third Doctor (Jon Pertwee) was known for. And then, there was The Doctor making an almost-glib reference to "my granddaughter". There is setup going on here, people! What is being set up, only Steven Moffat and a few others in the BBC's Doctor Who production offices know. But in the name of all that's good and holy The Doctor just mentioned Susan!! Not by name but that HAD to be Susan!! When was the last time Susan got mentioned in anything Doctor Who-ish?!? That very, very fleeting snippet of dialogue alone is going to make "The Rings of Akhaten" memorable. And I think it's going to become even more memorable as this season continues to unfold on the way to the fiftieth anniversary in November. In terms of performance, Matt Smith has perhaps never looked so dark, so dangerous, so defiant as The Doctor as he is now. It's a trend that began with "The Snowmen" and I was hoping to see that grow in "The Bells of Saint John". Last week's episode in retrospect missed the mark more than it hit... but having seen "The Rings of Akhaten" I'm feeling that groove again and it's getting deeper. I'm also really digging his revamped costume: it's definitely more brooding and dashing (sorta like he's got a Sherlock motif going lately). His "in-your-face" to what can only be described as a star god should go down as one of the most powerful scenes in Doctor Who history. Nothing else comes to mind that has so conveyed the triumph and the tragedy that is the life of The Doctor. Jenna-Louise Coleman is increasingly growing on me as new companion Clara, and I appreciated how her back-story was presented at the start of the episode. And for a role that came to have such import, I thought that Emilia Jones handled Merry quite well: a frightened child, without being especially "childlike" about it. And does that young lady have a lovely singing voice, or what?? But I thought the two biggest things that "The Rings of Akhaten" had going for it were its sense of scale and the episode's music. C'mon: when was the last time The Doctor had to take on an opponent like that?? We're talking cosmic scope the likes of Jack Kirby and Steve Ditko here, folks! I have to tip my hat to freshman Doctor Who scribe Neil Cross (creator of Luther) for cutting his teeth on such high-concept storytelling. This was his first time out the gate... and I think he's going to only get better. And so far as the music goes, Murray Gold was firing on all cylinders with "The Rings of Akhaten". The score went from setting the atmosphere to an integral part of the story... and I think he handled it magnificently. I want this season's soundtrack album right now, just to have the pieces he composed for this episode (along with Emilia Jones' choral accompaniment!). It also must be said that "The Rings of Akhaten" is an absolute feast for the eyes. One well-respected friend with cinematography experience remarked that he had "never seen a more beautifully filmed episode". The camera work, the composition, the music... all orchestrated together in one epic harmony. A very, very solid episode that gracefully overlooks whatever faults it may have. "The Rings of Akhaten" gets Four and 1/2 Sonic Screwdrivers from this Whovian blogger! Next week: The Doctor and Clara aboard a nuclear submarine amid tensions between the American Navy and the Soviet Union. Six days from now brings us "Cold War"! EDIT 11:20 p.m. EST: So what did it look like when The Doctor fought a god? Somebody has kindly posted "the speech" scene. It's the same car that killed Pete Tyler?????? OK, I just checked and it is! What does it mean???? Super -super- episode! I've had Mary's song playing in my head since last night. That was Gold's best music of the series after The Girl In The Fireplace. Good review but you forgot the best line of the show: "We don't run away." "We don't run away." Loved that line :-) I also *really* loved the speech that The Doctor gives Merry, about how she was unique in all the universe. Come to think of it, Clara's confronting the god was also amazing. Wow... this episode sure did have some great dialogue!! But it sure seems to have split the fanbase. Some are saying it's the best of the season and some are saying it's the worst.